many games are now available for Ubuntu,but Steam will also play in most other Linux distros also . Get Steam! Here is a site with a large list of games for linux. It's worth checking out! to create an x config file. During system bootup process, kernel gets loaded into the memory and it controls the entire system. When the system boots up, it prints number of messages on the screen that displays information about the hardware devices that the kernel detects during boot process. Savvy Windows users have to watch their virus checkers as closely as the head nurse in the ICU keeps an eye on patient monitors. Often, the buzz in the Windows security world is about which protection-for-profit firm was the first to discover and offer protection for the malware du jour -- or should I say malware de l'heure? The only thing better than having backed the winning Super Bowl team come Monday morning at the office coffeepot is having the virus checker you use be the one winning the malware sweepstakes that weekend. Data loss will be costly. At the very least, critical data loss will have a financial impact on companies of all sizes. In some cases, it can cost your job. I’ve seen cases where sysadmins learned this in the hard way. There are several ways to backup a Linux system, including rsync and rsnapshot that we discussed a while back. 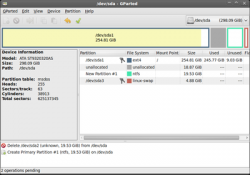 On Linux distributions, fdisk is the best tool to manage disk partitions. fdisk is a text based utility. Using fdisk you can create a new partition, delete an existing partition, or change existing partition. rsync stands for remote sync. rsync is used to perform the backup operation in UNIX / Linux. The GParted application is a graphical partition editor for creating, reorganizing, and deleting disk partitions.A disk device can be subdivided into one or more partitions. The GParted application enables you to change the partition organization on a disk device while preserving the contents of the partitions. For specific actions supported see detailed features. Supports hardware RAID, motherboard BIOS RAID, and Linux software RAID. Rsync is a fast and versatile file copying tool. Rsync is used for backups and mirroring and as an improved copy command.It has support for copying links, devices, owners, groups, and permissions. Rsync finds files that have changed in size or that have been modified. It can copy locally, to or from another host over any remote shell, or to or from a remote rsync daemon. It will send only the differences between the source files and the existing files in the destination. This will make a copy of the directory /media/sda3/pictures on another disc /media/disk/pictures .It keeps everything the same in both directories.If you were to add something to /media/disk/pictures it would be deleted when this command is run because the option --delete will keep the destination folder and the source folder the same.All permissions links etc will be saved to the copy(destination) directory.After I have added more pictures to the source folder /media/sda3/pictures I run the command to backup the latest pictures to the destination folder.It only copys the new pictures.Notice the trailing / in the command.You must have them. I use this with a external hard drive,but it is formated to the ext3 file system.Do not use this with a Windows fat file system.I created a shell script called picturebackup.sh that runs this command,it makes for easy backups of all my pictures.You could backup your music or movies etc.